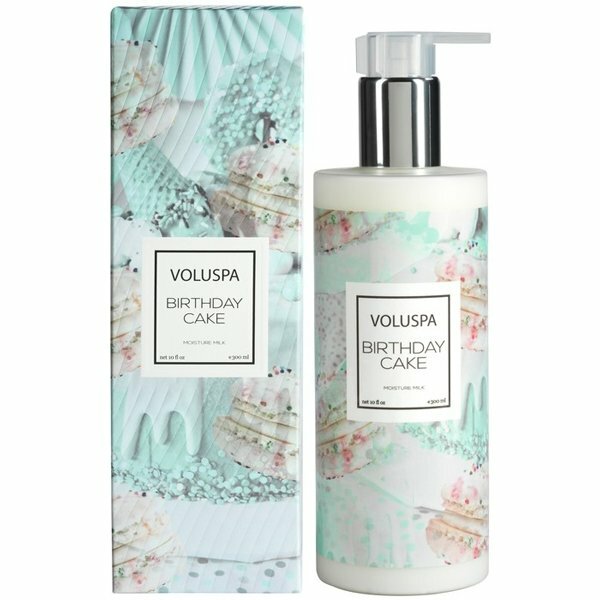 Voluspa Birthday Cake Moisture Milk is vanilla bean icing, fluffy crème cake and rainbow ball sprinkles. Voluspa Moistue Milk lotion hydrates parched skin with a lush milky lotion scented with a hint of yummy fragrance. Enriched with skin conditioning ingredients such as organic aloe, organic sunflower seed oil, and beeswax. Absorbs easily and leaves skin feeling soft and smooth. Packaged in a frosted bottle with a colorful pearlized wrap label.